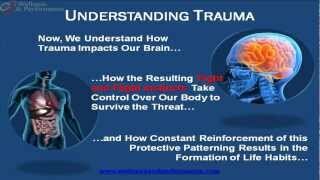 Watch this video to find out how Trauma and Stress impact the brain to create chronic conditions, like: chronic pain, depression, anxiety, post traumatic stress, and fibromyalgia. You will understand how the brain / body connection works and why nothing you've tried has helped so far. If you or a loved one suffer from chronic health problems no matter what you've tried, then you can't afford to miss this cutting edge information.